Today iOS 8 came out. There was a massive rush to try to install and download it. The one thing that we were not prepared for or made aware of was the need to have up to 4.7-6.9 GB of space available in order to download and install iOS 8. The reason you needed 4.7-6.9 available is that the 1.1-1.3 GB download of iOS 8 also needs to move a lot of files around during installation. If you are like us, you might not have that much space needed on your iOS device. We’ve spent the last year downloading music, videos and apps to the point where our iPads tell us to stop. So now we need to delete some of our stuff. Yesterday iOS 7 came out. There was a massive rush to try to install and it download it. The one thing that we were not prepared for or made aware of was the need to have up to 3.3 GB of space available in order to download and install iOS 7. The reason you needed 3.3 GB available is that the 900MB download of iOS 7 also needs to move a lot of stuff around during installation. 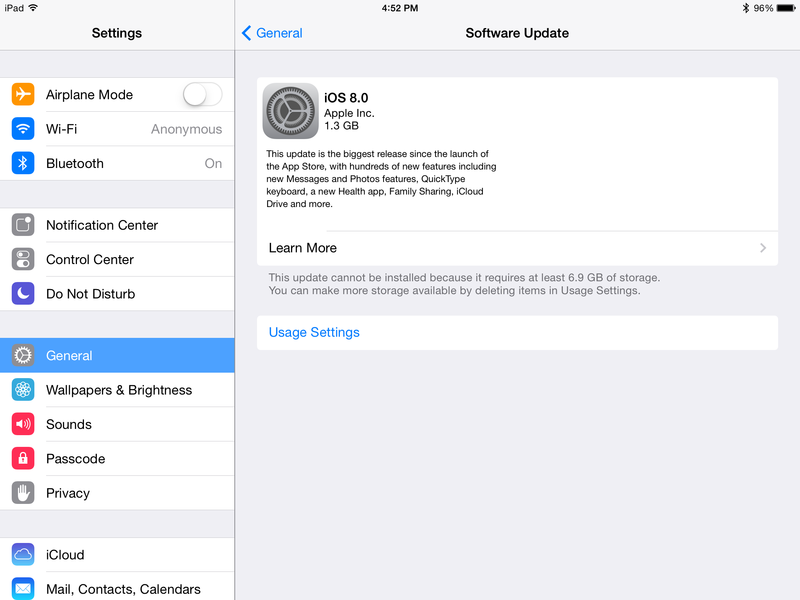 If you are like us, you might not have that 3.3GB of space needed on your iOS device. We’ve spent the last year downloading music, videos and apps to the point where our iPads tell us to stop. So now we need to delete some of our stuff.